Nature made him, and then broke the mould. 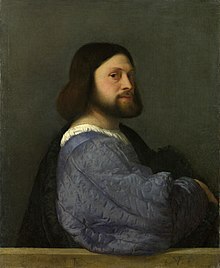 Ludovico Ariosto (8 September 1474 – 6 July 1533) was an Italian poet, author of the epic poem Orlando Furioso (1516), "Orlando Enraged". Of ladies, knights, of passions and of wars, I sing. Orlando, driven raving mad by love—and he a man who had been always esteemed for his great prudence. What a man sees, Love can make invisible—and what is invisible, that can Love make him see. Ah, cruel Love! What is the reason why you seldom make our longings correspond? Who gain experience from another's woe. Le cortesie, l'audaci imprese io canto. of courtliness, and of valiant deeds I sing. d'huom che si saggio era stimato prima. Driven raving mad by love—and he a man who had been always esteemed for his great prudence. Canto I, stanza 2 (tr. Guido Waldman); of Orlando. La voce ch'era per uscir fermossi. All vestiges of colour seem to drain. Favor gratia e bellezza tutto perde. A virgin is like a rose: while she remains on the thorn whence she sprang, alone and safe in a lovely garden, no flock, no shepherd approaches. The gentle breeze and the dewy dawn, water, and earth pay her homage; amorous youths and loving maidens like to deck their brows with her, and their breasts. 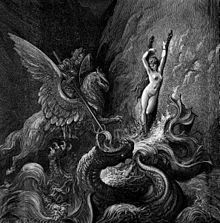 / But no sooner is she plucked from her mother-stalk, severed from her green stem, than she loses all, all the favour, grace, and beauty wherewith heaven and men endowed her. As a flower springs up secretly in a fenced garden, unknown to the cattle, torn up by no plough, which the winds caress, the sun strengthens, the shower draws forth, many boys, many girls, desire it: so a maiden, whilst she remains untouched, so long she is dear to her own; when she has lost her chaste flower with sullied body, she remains neither lovely to boys nor dear to girls. Ben'e ostinato se merce non grida. For when the water is up to your neck you must be truly stubborn not to cry for help. A poor wretch will readily believe whatever suits him. Il discorde voler ch’in duo cor miri? You seldom make our longings correspond? Two hearts discordant, one repelled, one fond? Dove non via, dove sentier non era. And giddy precipice, where path was none. Sol in virtù non ha possanza alcuna. But Virtue soars beyond her love and hate. Parean tener d'ogni baldanza privi. Their gaze averted, of all hope devoid. Ch'amareggiare al fin non te la voglia. Of them I thought it wiser not to treat. So, leave the bitter and retain the sweet. The inmost heart one seldom can discern. E stimato bugiardo ne rimane. The mist of ignorance, esteems untrue. A cui la castità levata sia? A destra et a sinistra, e basso et alto. Sparkle and gleam, in all directions dancing. Che tutti spargon poi per l'aria i venti. And scatter all his solemn vows in air! Ch'essere accorto all'altrui spese impare. Che non ha palo ove s'appoggi o piante. Support to cling to, you would be. Mai non fu biasmo, ma gloria sovente. Was never blamed; with glory oftener paid. Natura il fece, e poi roppe la stampa. In which she cast him. Variant translation: Nature made him, and then broke the mould. Compare: "I think Nature hath lost the mould / Where she her shape did take; / Or else I doubt if Nature could / So fair a creature make." A Praise of his Lady, in Tottel's Miscellany (1557). Henry Howard, Earl of Surrey wrote similar lines, in A Praise of his Love (before 1547). Compare also: "Sighing that Nature formed but one such man, / And broke the die—in moulding Sheridan." Lord Byron, Monody on the Death of the Rt. Hon. R. B. Sheridan, line 117. As reported in Hoyt's New Cyclopedia of Practical Quotations (1922). And every chance to thwart true lovers takes. Cader de la padella ne le brage. The hearts of men are often kind and true. Vincasi o per fortuna o per ingegno. Whether it be by fortune or by skill. No lamentation to his grief is owed. Without which valour seldom has succeeded. And dies contented, if with fame he dies. As manifested plainly, 'twas a lie. Carlo sapea, quando volgea la faccia. When favourable to him her face she showed. Perder duo vivi per salvar un morto. Two living men to lose for one dead man. When high on Fortune's wheel he sits, serene. And the same loyalty in all is seen. Remains, nor after death does he depart. Por l'arme in mano a chi può più di noi. Che quant' era più ornata, era più brutta. Beauty when most unclothed is clothed best. But is, when unadorned, adorned the most. Fatto per timor, nullo è il contratto. Void is contract made in fear. Che 'l consiglio del mal va raro invano. For seldom ill design is schemed in vain. E l'han girato da poppa e da prora. it turns and yaws as if the crew were lost. Perché non ben risposta al vero dassi. For to the truth no answer can be found. Ch'al lungo andar non sia chi 'l vegga e note. That someone does not notice finally. E Fortuna talor trovi ribella. The mountain, motionless, unchanging stays. Mi fa sempre apparir la luce mia. as if a spotlight were on me with its glow. Il grido e 'l bando per la terra scorse. The loud proclaim they through the town declare. Che, per altri voler, perder se stesso? Than self-destruction, of a mind insane? Si convengono i ceppi e la catena. Easily is the vanquished side excused. Che 'l fuoco arde la paglia facilmente. How easily the fire consumes the straw. Che star non possa con Orlando a prova. Se spesso nuoce, anco talvolta giova. Though harm he does, he serves the good as well. Natura d'ogni cosa più possente. The master-hand of Nature is supreme. Che l'amar senza speme è sogno e ciancia. For hopeless love is but a dream and shade. Meglio improviso, ch'a pensarvi, usciti. Is better than if pondered well, and weighed. Al suo fisso destin può contradire. Cannot evade his hour of destiny. Col pugno chiuso al re di Sericana. With a clenched fist at him of Sericane. E d'una fetida erba nasce il giglio. E parli più di quel che meno intenda. And most attempt to speak when least they know. For beauty is enhanced by clothes of style. No woman yet was ever content with one. Non far altrui quel che patir non vuoi. That which yourselves would wish undone to you. Né può stato mutar, per mutar loco. O degli uomini inferma e instabil mente! Come siàn presti a variar disegno! Più quei che nascon d’amoroso sdegno. Still prone to change with every changing wind! Where sprung from sense of disappointed love. La barba folta, spaventosa e brutta. His face was thin and fleshless as a bone. And shaggy beard were wild to look upon. La Fortuna, che dei pazzi ha cura. Fortune, who takes care of the insane. Saria di quel d'un amoroso core? Da quella rabbia detta gelosia. That frenzied rage, which we call jealousy? Chi provato non ha la guerra prima. He has experienced a state of war. Pur viene al fin, se ben tarda a venire. A lover in the end has his reward. Misero è ben chi veder schiva il sole! To look upon the visage of the sun. Fuor d'una bocca, in infinito cresce. Fame to a boundless torrent quickly grows. E non far d'un gentil contrario effetto. And not transform to rude a gentle breast. La parte o affermi, e sue ragioni alleghi. To plead before the judge pronounces doom. E tanto men, quando altri n'ha a patire. And even less, if someone it may hurt. Eran le perle, eran le ricche gemme. Are rarest pearls and other precious gems. A voi perdonar sempre a chi si pente. To sin, and thine to pardon who repent. L'abito poi difficile a mutarsi. And use is second nature, hard to change. Che chi dà morte altrui debba esser morto. Who slays another, shall himself be slain. Che duri sempre, così ancor né ria. So ill endures no more. Ch'ubbidiscon più a quei che più in odio hanno. Whom most they loath the people most obey. All'arbore che 'l vento in terra getta. To gather firewood from a fallen tree. Chi mal opra, male al fine aspetta. Ill doers in the end shall ill receive. Non potrebbe comprare oro né argento. No silver and no gold could ever buy. Signor, di sempre accrescere ha in usanza. Has always tended to exaggerate. Dolce cosa era la patria. Quel ch'era ingiusto e illicito a giurare. Which 'tis unlawful and unjust to swear. And Neptune's white herd lows above the main. Le agghiacciò il sangue e impallidille il volto. [He] blanched her cheek and froze her youthful blood. Ch'avendo ove sfogarlo, è meno acerbo. Which, being vented, is less bitter now. Ben che stia mal che l'uom se stesso lodi. Though it becomes not man himself to praise. Difenderallo, e in mezzo al fuoco ardente. A peril, or survive in raging fire. Ed ei si procacciò la sua ruina. And all his fortune changed from good to ill. Se per nome e per opre non è casta. Neglects to lead a chaste and seemly life. ra' l'uom talvolta, che sel trova avere. A man the gravest sacrilege commit. Ch'ove femine son, son liti e risse. Where women are, are arguments and strife. E sopranatural cosa si crede. Che sia lor re, lor capitan, lor guida. To be their king, their captain and their guide. 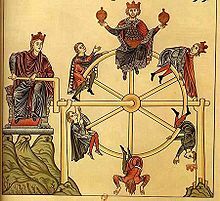 The higher up on Fortune's wheel you see a wretch ascend, the sooner he will fall, and where his head is now, his feet will be. Ove ora ha il capo, e far cadendo il tomo. And where his head is now, his feet will be. Che sempre la sua ruota in giro versa. Shame ends in glory, glory ends in shame. She turns her wheel for better, as for worse. Ordina l'uomo e Dio dispone. Giordano Bruno, De gli eroici furori (1585). 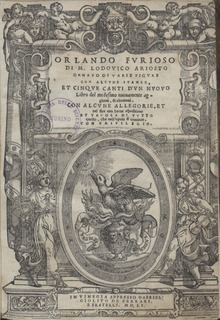 Of Ariosto's Orlando Furioso, as reported in Hoyt's New Cyclopedia of Practical Quotations (1922). Till they are ashes, and repose with me. By the transparency of his bright dream. Ce qui m'a surtout charmé dans ce prodigieux ouvrage, c'est que l'auteur, toujours au-dessus de sa matière, la traite en badinant. Il dit les choses les plus sublimes sans effort; et il les finit souvent par un trait de plaisanterie qui n'est ni déplacé ni recherché. C'est à la foi l'Iliade, l'Odyssée, et Don Quichotte: car son principal chevalier errant devient fou comme le héros espagnol, et est infiniment plus plaisant. Il y a bien plus, on s'intéresse à Roland, et personne ne s'intéresse à Don Quichotte, qui n'est représenté dans Cervantes que comme un insensé à qui on fait continuellement des malices. What has especially delighted me in this prodigious work [Orlando Furioso] is that its author, always in command of his material, treats it with gay badinage. He effortlessly gives voice to the sublimest things only to finish them with a twist of pleasantry which is neither out of place nor recherché. It is the Iliad and the Odyssey and Don Quixote all rolled into one—for his principal knight errant goes mad like the Spanish hero, and is infinitely more attractive. Furthermore Orlando captures one’s interest while no one is interested in Don Quixote, whom Cervantes represents simply as a fool on whom japes are constantly practised. This page was last edited on 13 May 2018, at 21:24.